This is the part 2 of 3 in PHP CRUD tutorial. In this part of tutorial, we are going to create "Create" and "Read" pages of PHP CRUD grid. To start, we firstly need a navigation button which leads to "Create" page and also a button to read a record. Open "index.php" file we created in part 1 of this tutorial. And add a "Create" button at the top of the table, and also "Read" buttons for each row of the table. Create a PHP file "create.php"; This file contains an html form and it is the "Create" part of CRUD grid. We will go through this file as two parts. As you see, firstly we check if there is form submit by checking $_POST variable. If so, we check each entries to ensure they are not empty. Additionally for email address entry, we use PHP filter to verify if it is a valid email address. Then if it passes all validation rules, it inserts data to database using Database class. At last it will redirect to "index.php" using PHP header() function. However if there is any validation error, the validation variables will be showed in the form. Create some records by entering correct customer information. You should be able to see a CRUD grid as below. You must have noticed a "Read" button for each row. That is what we have added in step 1 of this tutorial. If you click it now, it will lead you to an error page. And that is what we are going to create next step. 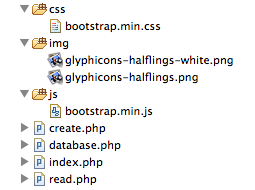 Create a PHP file "read.php"; this file is the "Read" part of CRUD grid. Comparing to "Create" part, this step is pretty straightforward. Copy codes below to the file and we will explain afterwards. Firstly let us look at the beginning part of the PHP codes. What it does is that, it tries to allocate a $_GET['id'] variable. If it is not found, it redirects to "index.php" page. Otherwise, it will read data from database using the "id" field and store data into a PHP variable $data. Next part, which is the static html part, is pretty simple. It prints out the $data variable. In next tutorial (PHP CRUD tutorial part 3), We are going to create the "Update" and "Delete" pages of PHP CRUD grid. Make sure you bookmark this page and come back to visit us next week. We will provide source code package at the last part of this series of tutorial as well. And also if you enjoy this tutorial, please share them using the share buttons on left side of the post.